websites = life | doberman pizza. The life of a web developer is basically just websites. Unless, you know, you like to go outside or something. But going outside’s beside the point of this post. This post is all about websites. Pretty little websites, all in a row. Big ones, small ones, wikis, social networks, coffee pot webcams, and more. So, yeah, I spend a lot of my time on websites. Some of them you’ve probably heard of, and some you probably haven’t. Take, for instance, Wikipedia. You haven’t heard of that one, right? It’s a homework help free content farm online encyclopedia that has lots of cool stuff on it about small villages in England and bizarrely named dog breeds and stuff. I’ve been editing Wikipedia since about 2006, and, oddly enough, I feel like it’s actually helped me improve my writing skills. I’ve worked on a bunch of articles about Vietnam, and a few Bahá’í-related articles too. Speaking of Bahá’í-related Wikipedia articles, Bahaikipedia is a thing too. It was created around the same time as I started writing on Wikipedia; I even blogged about it way back when I first started contributing there. It’s quietly but steadily grown over the years, to the point where there are now over 4,000 articles. Take a look through it when you get the chance, and if wikis are your thing (or even if they’re not), why not create an account and start contributing yourself? 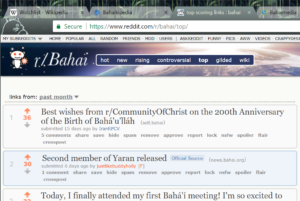 Speaking of places where you should create an account and contribute, did you know that there’s a Baha’i Reddit group (aka “subreddit”)? It’s an interesting place to have conversations on all kinds of topics related to the Bahá’í Faith, and it’s pretty legit—well, at least legit enough to be featured on Bahá’í Blog, in an article marking its 9th anniversary. There are also related subreddits about Bahá’í history, photography, web/software projects, news, quotes, so there’s something for everyone. Over the past month there’ve been some pretty good threads on a variety of topics, including Light to the World, the new documentary on the life of Bahá’u’lláh; how one goes about becoming a Bahá’í; backbiting; the purpose of life; favourite recipes for 19-day Feasts; and more. Conversations can get challenging sometimes because it’s a forum that’s open to everyone, but the group is (ahem) pretty well moderated and, as a result, the cream tends to rise to the top. Speaking of Reddit and having conversations, some Reddit users got together and created a Baha’i chat server on a platform ironically called “Discord”, which is popular with gamers and offers text, audio and video chat. It’s a fairly new server, but there are usually a few people online to chat with, for those who’d like the chance to talk to Bahá’ís and their friends in real time. They’ve created a new front page for the server with the amazing domain name bahai.fyi (don’t you just wish you had registered that one). This entry was posted in baha'i blog, by the way... and tagged bahaiblogging, internet, reddit by danger. Bookmark the permalink.